Last Saturday I had the great pleasure of hosting a couple of my old college pals for a relaxing day on the Portage Lakes—a chain of several inland lakes just a mile or so south of Akron. One of my friends is a younger brother to the Conways of Great Lakes Brewing Co. fame, so it was no surprise that he showed up at my house with a cooler filled with 12 bottles of their new Sharpshooter Session Wheat IPA. While that was indeed a wonderful gesture, I explained to him that the Portage Lakes, being state-owned lakes, do not allow alcohol on board any vessels. At all. My friend, who primarily boats on Lake Erie, was unaware of this, since on the Great Lakes, it is ok to have and consume alcoholic beverages on board (except if you’re the captain and operating the boat – your BAL must not exceed the legal limit). That noted, the three of us left the cooler at my backyard Tiki bar and headed off to The Lakes, where we scored our pontoon and set off to check out the various restaurants and watering holes that can be found there. The weather was beautiful; mid-80’s, a mild breeze and total sunshine—in other words, perfect boating weather. I won’t get into all the details of our trip; as captain of the boat, I was obviously designated as the responsible party in terms of consumption, which was very limited. However, a couple of beer highlights did include a sample of the previously-mentioned GLBC’s new Sharpshooter Session Wheat IPA as well as the delicious Founders Brewing Rubaeus Raspberry Ale. The Sharpshooter was a pleasant surprise; I’ve always made it clear I’m not a fan of many IPA’s—most American versions are too bitter for my taste. Wheat beers are also not on my regular list…while some are refreshing, others are a little too highly spiced, or have a shade too much clove flavor for my taste. The GLBC product was bright and well-balanced; clearly a wheat ale, but not overly-hopped, as there was little if any residual bitterness. At a shade over 4% ABV, it qualifies (in America) as a Session ale. Just a touch of citrus fruitiness made it quite refreshing, and I was intrigued by the Jarrylo hops—a dwarf hop variety with which I was not previously familiar. I wouldn’t mind home brewing with those. The other beer I particularly enjoyed was the Founders Rubeaus. I had first sampled this a couple of weeks prior during a brief stop at The Highland Tavern and enjoyed it immensely. I enjoyed it even more sitting at On Tap (formerly The Harbor Inn) on West Reservoir, which was packed with happy people enjoying the sunshine. Normally, I like my berry-beers on the mild side, with just enough berry flavor to offer some character and extra refreshment. The Rubaeus goes all-in, however—exploding in your mouth with a generous sweet-and-tart fresh raspberry taste and a clean, dry finish. The aroma is deliciously fruity, as you might expect, and the color is a brilliant red. If I hadn’t been captain of the boat, I would have enjoyed more than one. 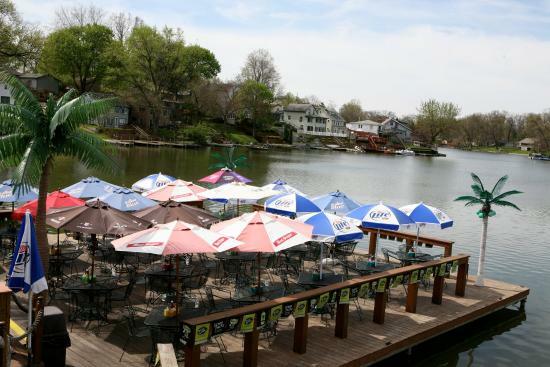 We were able to stop at a couple of other spots as well, such as The Upper Deck and The Nauti Vine (which makes its own beer) – so my friends had ample opportunity to see (and taste) what The Portage Lakes has to offer. There are some other fun places out here too, like Dusty’s Landing, Dietz's Landing and Howie’s on the Lake, which we did not have time to visit. Overall, this is a great summertime spot to go, whether by sea or by land. My friends, who hail from the Cleveland area, had never been here before, and they thought the atmosphere similar to the (old) Cleveland Flats or even Put-in-Bay (though not quite as rowdy; the crowd here skews a little older). Most of the places here have a beer selection to fit any taste—but you have to keep in mind the waters are patrolled, so boat captains must be responsible and operate safely. The lakes and the connecting channels can get crowded on warm summer weekends, so it’s important for you or someone in your group to be operating the boat with a clear head. That said, you must check this area out.